And they said this show was dead! C5 to commision a series where Rox travels the UK to accuse random blokes of leathering her to see their reaction? Makes sense that the top two would be royalty! we love a famous celeb! Just realised that all that activity would’ve only happened in the last 4 months, while Meghan’s had all year. Who really won? 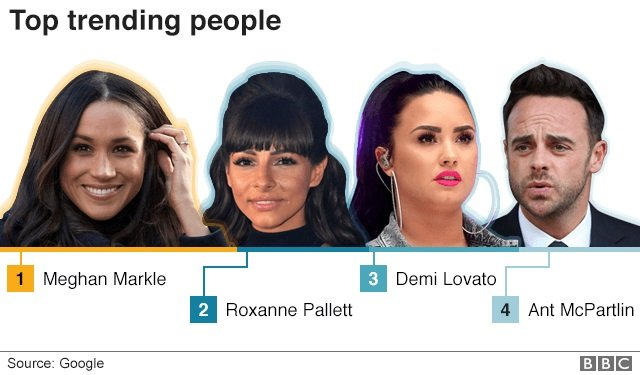 roxanne is a national icon! I don't think becoming second most Googled - for the reasons she achieved that - is anything to be proud about. It does show how much of a national stir she/the show caused though, which many probably thought was impossible at that point. Yeah, it shows how the Big Brother house can be seen of as a mini-society, and how the show can raise a talking point about something in the real world. No other reality show could do that in the same way, I think. Very true. What other reality show has even offered anything COMPARABLE to the race row/david's dead/punchgate, just to name a few? Last edited by Scoot; 13-12-2018 at 11:44 AM. Hardly an accolade is it ! Top for being the most hated woman for weeks , months , years - who knows how long after trying to ruin a life and career. Meg, Roxy and Demi the trinity!!! "Hardly an accolade is it ! Top for being the most hated woman for weeks , months , years - who knows how long after trying to ruin a life and career. Please be kinder to Meghan, she’s trying her best.